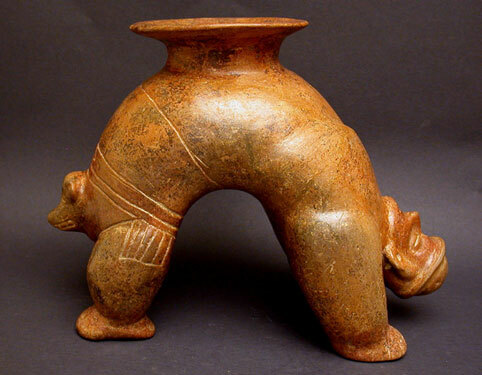 This red burnished vessel type male acrobat, standing in backbend position, is wearing a helmet-like head covering, has detailed facial features and musculature in relief on the chest and arm areas, with incised lines indicating an ornamental garment worn on the lower torso, framing the highly outcropped relief of a dog's, or other animal's head, baring its teeth, perhaps representing shamanic transformation. Cf. Kan, Meighan, & Nicholson, Sculpture of Ancient West Mexico, Nayarit, Jalisco, Colima, The Catalogue of the Proctor Stafford Collection, Los Angeles County Museum of Art, Page 134, Fig. 116. LACMA, 1989: "...Although acrobats are known in collections, those with backs so highly arched are rare." Provenance: Formerly in a private Southern California collection formed during the 1960s.